Nearly half of San Francisco’s population lives in a quarter of the land, the northeast quadrant of the city. Between now and the end of 2015, San Francisco is likely to gain another 30,000 people, most of them to this sector. This area is already one of the densest in North America, parts of it second only to Manhattan. And it already holds 42% of all San Francisco’s cars (150,000!) If these new people own cars similar to the rates of current residents, they will bring 12,000 additional cars into this quadrant. Even if all these cars have off street parking, how will congested NE streets have room for 24,000 – 36,000 extra car trips each day? Congestion isn’t linear. 8% more cars doesn’t make already congested traffic 8% worse. It makes it impossible. More people in the same square footage means we need fewer cars and less driving. It means we need to encourage people to go car-lite or car-free. Cars take up a lot of room. Parked curbside, a private car requires 200 square feet; in a garage 300 feet. The average car is parked 95% of the time. 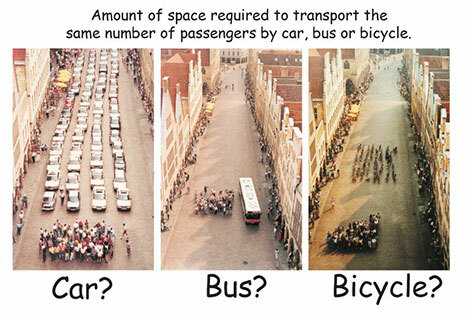 When actually in motion, the space that just two cars take up can fit twenty people on bikes or 30 people on a bus. When not in use, twelve bikes can park in the space of one car. 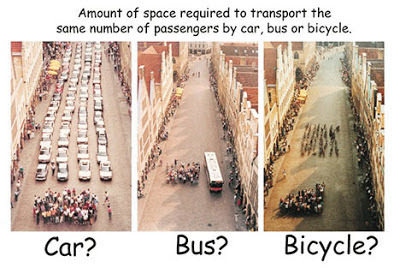 Parked or moving, cars are a highly inefficient use of public real estate. In the middle of Nebraska this is perhaps not an issue. In San Francisco it is. A modest 8% reduction in parking in the Polk Street area will affect few people. 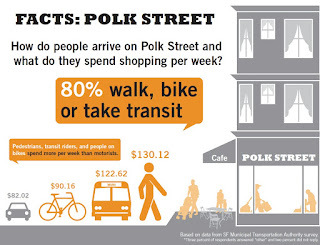 Already 85% of people come to Polk Street by modes other than car. Maybe this is because two-thirds of households in the neighborhoods adjoining Polk don’t own cars. (ACS data 2009.) Maybe this is because all of Polk Street is on or within a block of a bus line. Maybe this is because half of Polk is within a 15 minute walk of BART. 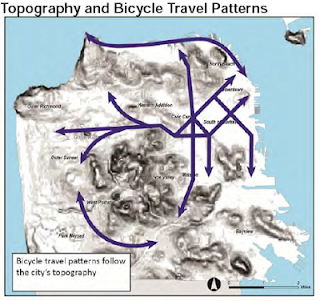 Maybe this is because Polk Street is the geographic center of the NE quadrant, which means potentially half the population of the city can bike to Polk Street within 20 minutes. San Francisco has hills. Main arterials and shopping neighborhoods are found in the flat parts between them for a reason. Currently there are no bike lanes that extend from Market to the north part of town between the Embarcadero and Arguello. This means there is no safe way for bicyclists to reach a huge chunk of the city. Gnarly hills mean Polk Street is the only north/south route for bicyclists to take for a mile in either direction. (Van Ness is flatter but it’s not an option because it’s part of US 101.) This is why Polk is already the street with the highest rate of biking north of Market between the Embarcadero and the Wiggle. This is why Polk matters so much. Cars are expensive. Median incomes for the bottom 93% of Americans are declining. Young people, especially new college graduates, have high student debt loads. Streets designed to make driving easy and any other mode of transport miserable mean that anyone who cannot afford a car in San Francisco is miserable, an active form of discrimination against the young and the poor. Biking for transportation is a fifth the cost of taking Muni, 3% the cost of owning and operating a junker car, and 1% the cost of owning any car under seven years old. Cars don’t help city economics. Of the $9122 a year it takes to own and operate a newish car, 84% leaves the local economy. When people don’t own cars, it frees up their disposable income. People who don’t own cars are more likely to patronize businesses and restaurants close to home than people who drive. Fears on the part of Polk Street merchants that business will drop if bike lanes are added are unfounded. 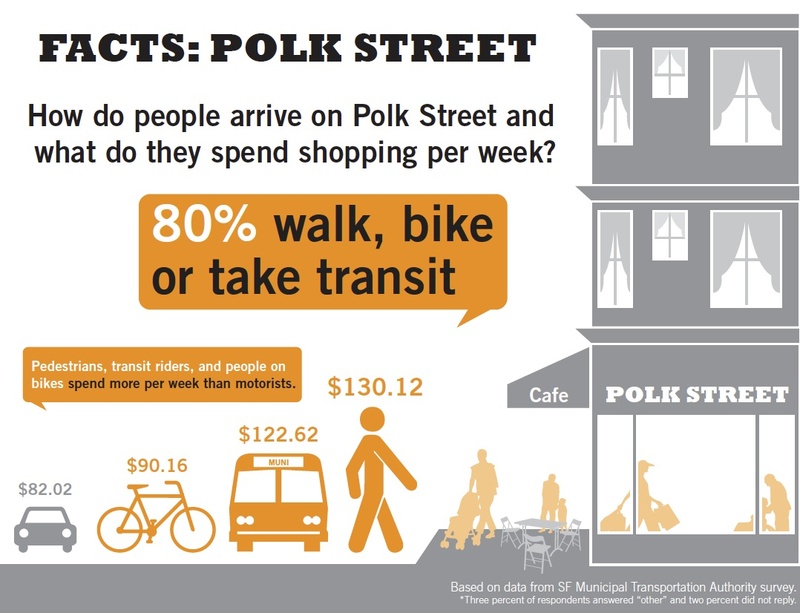 A study by the SFMTA shows people on foot and on bike visit Polk Street more often and spend more per week at local merchants than those who arrive by car. Both in New York and San Francisco, added bike lanes have resulted in increased business for local merchants. 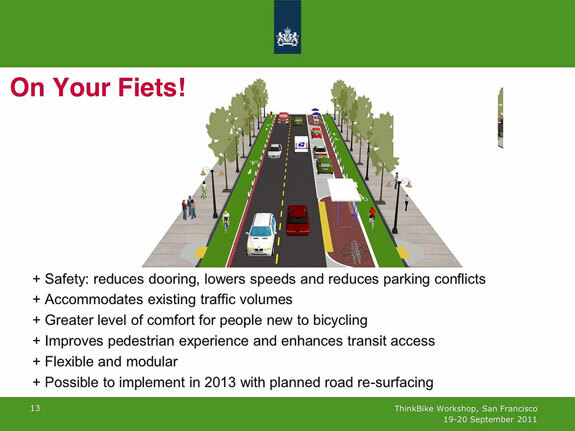 In addition, when bike lanes are added to a street, property values are shown to increase. 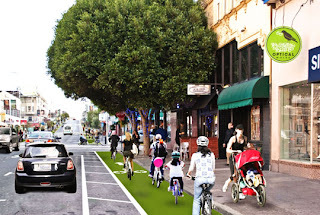 Bike lanes help, not hurt, local business and property owners. Bicycling is also far cheaper to the taxpayer’s pocketbook. Every Muni ride is subsidized by the taxpayer $.61 per passenger mile. Right now San Francisco can’t even come up with funds to keep our buses in adequate repair, and many Muni lines are at capacity. Where will the money come from to pay for extra buses and drivers to service the new people moving in? On the other hand, encouraging people to drive also costs us. Car drivers cover less than 15% of the direct cost of their city driving via gasoline and vehicle taxes. 85% is paid for out of the general fund. Compared to buses, trucks and cars (that have 100 to 500 times the mass), bikes inflict a micro amount of damage on the road, necessitating little or no repair or maintenance. When cars cause accidents, emergency personnel response and the subsequent clean up are funded by taxpayers. 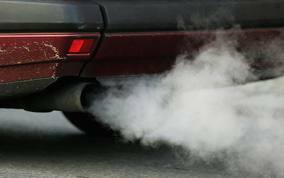 Health and environmental damage inflicted by cars and not paid for by the driver (for example from uninsured motorists, toxic residue, and particulate matter from car emissions) are paid for by the individual injured, the city of San Francisco, or society at large. Factoring in the direct costs of driving and the indirect cost of parking, land, crashes, congestion, and health damage due to air pollution (but not climate change or other environment-related costs), San Francisco subsidizes car driving $.53 every mile. Biking only costs $.01 for every mile. If we want people to go car-lite or car-free, it’s far easier for them to do this using a bike for transportation than relying on Muni. For trips under two miles, bikes are as fast as cars, twice as fast as Muni, and four times faster than walking. For trips under four miles, biking is just 5 to 10 minutes slower than driving and equal to Muni or faster. (It depends on how many transfers the particular Muni trip requires.) Though bicycles do get the occasional flat tire, they are far more reliable than Muni in getting you where you want to go. And if you live on a hill or have physical limitations, an ebike makes biking a breeze. (Hill + shuttling children? 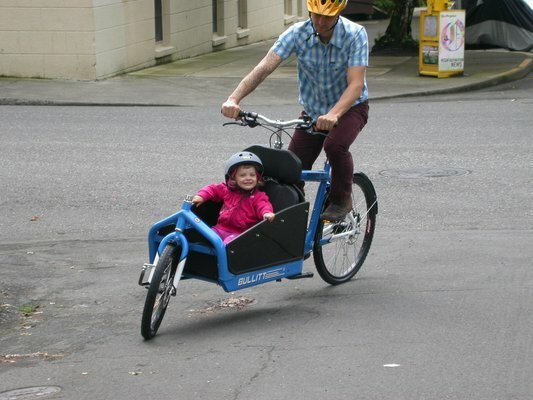 Electrified cargo bike!) In the Netherlands, bicycling is so safe and convenient most children bicycle to school and seniors bicycle well into their 70’s and even 80’s. Polk Street has one of the highest rates of cars injuring bicyclists of any street in the city. Bicyclists are injured on Polk Street at four times the rate of other streets with comparable numbers of bike riders (Harrison and Arguello.) In 2006, a young woman bicyclist was killed by a hit and run driver on Polk Street. Many, many others since then have had bones (arms, hips, legs, elbows) shattered, on average 20 or so injuries a year. Keeping Polk Street as it is ensures that more deaths and injuries will occur, often to young people under 30 who are sons and daughters of someone and are just trying to lead decent lives on not a whole lot of income. 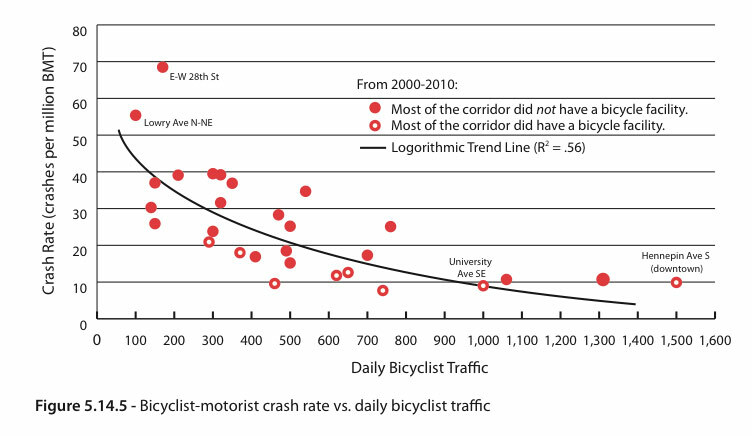 Streets with protected bike lanes are proven to have lower bicyclist injury rates. Surprisingly, streets with protected bike lanes have also shown to have lower pedestrian injury rates. Better-designed streets save lives and reduce our collective health care costs by not necessitating hospital stays, MRIs, blood transfusions, etc. Though most people enjoy bike riding, currently the vast majority of San Franciscans won’t ride bikes because they are unwilling to duke it out with cars in our stressful traffic. Safety is an issue, but it’s proven that stress is the bigger one. Studies show that creating a network of low-stress, connected bikeways (protected, separated bike lanes that cars and delivery trucks can’t continually double-park in) is the greatest single determinant in whether the average person will use a bicycle for transportation. 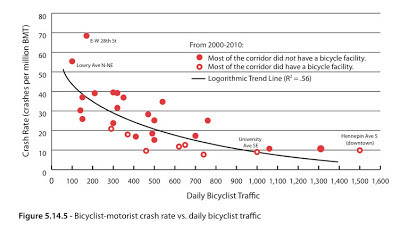 Studies show that the more people bicycle, the more the rate of bicycle injury drops, partly because motorists grow to expect and watch for bicyclists and partly because on streets calmed by bike lanes and lots of bicyclists it's harder for motorists to speed. (Speed kills. The lower speeds are why the more people bicycle, the fewer pedestrian and car driver and car passenger injuries there are as well.) Encouraging bicyclists with their own low-stress space in and of itself produces safety for all road users. Encouraging bicyclists to ride through a neighborhood also adds safety by deterring crime through more eyes on the street. Motorists speed through neighborhoods noticing little. Bicyclists have no obstructions or blind spots. They see everything. The more people bike, the healthier they are. Studies show that people who bike to work have fewer sick days and are more productive when they are at work. They also are happier, live longer, have more years of healthy life, and require less dollars of medical treatment each year than people who drive to work. If companies have access to a healthy workforce, their health care costs are lower. This gives these companies a competitive advantage. (Health care costs account for nearly 10% of average employee compensation expense.) In addition, unless they are hit by cars, healthy people have much less reason to visit the SF General emergency room. When people can’t pay for their visit to the SF General ER, we all pay. Though for half a century Americans have tried to arrange their lives to avoid all forms of physical exertion, it turns out that the human body becomes sickly if it doesn’t get 30 minutes of moderate exercise a day. (Studies also show that the more hours spent driving, the more unhealthy you are.) Incorporating this moderate exercise into one’s transportation is the most reliable and least costly way of obtaining it. Creating a physical environment where driving is encouraged while walking and bicycling are kept dangerous and miserable is a tragedy for human health. The city of Copenhagen goes out of its way to encourage its citizens to bicycle for transportation because they estimate they save 42 cents in health care costs for every mile biked. This is so big, it’s hard to know where to begin. If you’re reading this on-line, check here, here and here. Suffice it to say that per capita oil consumption in the US has been dropping and will continue to drop whether we like it or not. This mostly won’t be through greater fuel efficiency, but rather from people going car-lite and car-free altogether. (It’s already happening.) In addition, total energy consumed per person is dropping in the US and will continue to drop whether we like it or not. San Francisco already consumes less total energy per person than almost anywhere in the US. The more San Francisco facilitates its citizens to use less energy, the more economically competitive our city will be and also the more resilient. Cars are huge energy-slurping machines, even electric ones. Making it possible for the average person to live well without a car will protect San Francisco from many of the negative impacts of world net energy decline. Car-intensive, high energy-consuming regions, in contrast, will find themselves mired in economic contraction. Be glad you live in San Francisco where there is some form of transit and people willing to walk and bicycle. (If you live within walking distance of a BART or Caltrain station, you are doubly blessed.) Our transit, biking, walking, and energy efficiency may very well be what allows San Francisco to prosper in the years shortly ahead. This is real. Climate change due to humans burning fossil fuels is happening. Cars and coal are on their way to making much of the planet uninhabitable. The only ones denying it are those making a profit from the status quo or those who get their information from Fox News. If in ten years you don’t expect to be alive, nor any one you love, then, sure, you’ll skip most of the worst impacts. Why be inconvenienced? But if you have compassion for the folks who won’t escape the famine, the refugees, the heat waves, the disease, the extinction of most large mammal species, not to mention the potential utter collapse of civilization, you might feel a bit overwhelmed. Here’s a deal. For 2013, you don’t need to buy carbon offsets or get rid of your car (unless you’d like to rid yourself of $9000/year of costs.) What you can do to lower your city’s carbon footprint is simply support others who are already trying to live carbon-free. 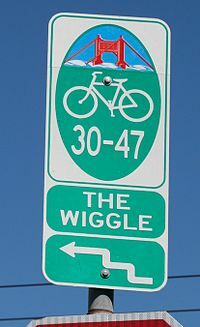 Avoid driving high bicycle corridors like the Wiggle, drive gently around bicyclists when you pass them on side streets, and stop griping that they don’t stop at stop signs. (Yes, bicyclists should absolutely yield to pedestrians and other traffic that have the right of way! But the second you are on a bike you’ll see why it’s sensible and safe to slow down in order to yield rather than completely stop.) And, first and foremost, encourage bicyclists by having your city give them just a little space so that biking does not end up killing them and making their mothers bitter to the end of time. That’s all. Even if you can’t stop driving right now, that’s what you can do this year to contribute. It’s nuts that San Francisco has voted to divest its retirement funds from fossil fuel industries but won’t take the simplest of steps to support those trying to live fossil fuel-free lives. Car traffic does not help Polk Street, it hurts it. 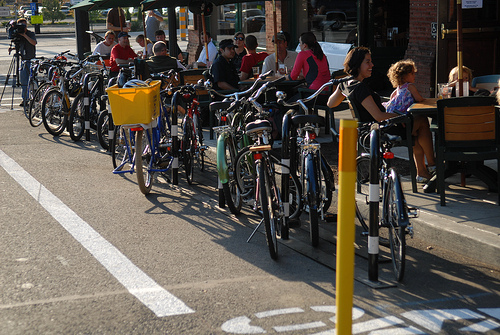 Bike lanes will bring bicyclists from all over the city to Polk who would not come otherwise. Bike lanes will bring tourists traversing between the Civic Center and Ghirardelli Square/Fort Mason. People like to shop and linger on streets that are pleasant, hospitable and safe, not ones filled with noise, pollution, filth, crime and danger. Because Polk Street is the geographic center of the NE quadrant of the city and a natural place for people to congregate, reduced car parking, car pollution and car noise could cause Polk to absolutely blossom both as a neighborhood and as a destination. City living doesn't have to be polluted, ugly and dangerous. Pay attention to the hurricanes, the droughts, the fires, the floods, the food shortages this summer. Note the riots, the uprisings, and the revolutions. Realize what you do this year and next counts. Your children and grandchildren will remember it. Which side will you stand with, the one speaking for them, or the one that will, without a qualm, sacrifice the future for the sake of not walking two extra blocks? We need to design a Polk Street that will work for the reality close at hand in 2015, not fearfully preserve at all costs (and in the face of all reason) the Polk of 1995. Protected bike lanes (in both directions) on Polk Street matter. Contact any or all of the following: the San Francisco Metro Transit Authority , the SFMTA Board of Directors, Mayor Ed Lee, Board of Supervisors President David Chiu, and/or your own city supervisor. Tell them you heartily support protected bike lanes on Polk Street and the city's fossil-free future. Thanks so much for the informative article, Karen. I will keep writing letters to city and transit officials. My spouse and I walked Polk Street from Sacramento to Union Streets Sunday before heading into Cow Hollow, then a bus up the hill and a flatter walk home. We originally needed just wall anchors at a hardware store but sort of remembered: coffee for the house, a box of chocolates for a work colleague, a snack to stave off hunger, a mother's day card for mom. We also discovered a new gallery of city paintings and a new cafe (at least, new to us), perused a half dozen more stores for shoes, but didn't find anything. And of course, we talked the whole way, so a really nice way to unwind together. Had we taken the car to complete the first errand (wall anchors), we would never have strolled and dropped money and completed errands at the other five places or seen the other stores. It's not impossible of course, but one just doesn't usually exercise that flexibility and mind set when driving. We are so brainwashed to believe shopping only happens by car when in the city it's demonstrably not true. I wonder if most of Polk's merchants live in suburbs or the edges of SF and do most of their personal shopping in suburban-type malls? It might explain their unwillingness to comprehend most of their customers are not car-based. Even with current levels of parking, for anyone who shops via car Polk is not an attractive option. Polk should play to its strength, not try to out-compete strip malls. Such a great, balanced, logical, and well-researched article, Karen. I'll do my part by continuing to keep trying to convince more and more people to bike as much as possible. Thanks, Andrew! The more who bike, the safer we all are.